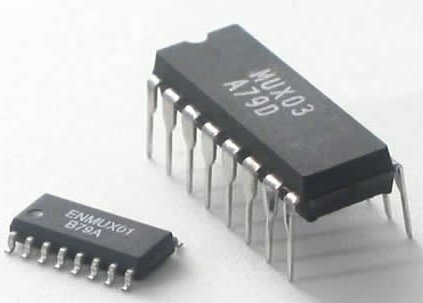 This IC is a programmable, 2-channel frequency-to-digital converter for use with any frequency, period, duty-cycle, time interval, phase-shift and pulse number signal. There are 16 measuring modes, 1 generating and calibrating mode. Frequency range 0.05 Hz - 7.5 MHz (120 MHz with prescaling); programmable accuracy 1-0.001%. 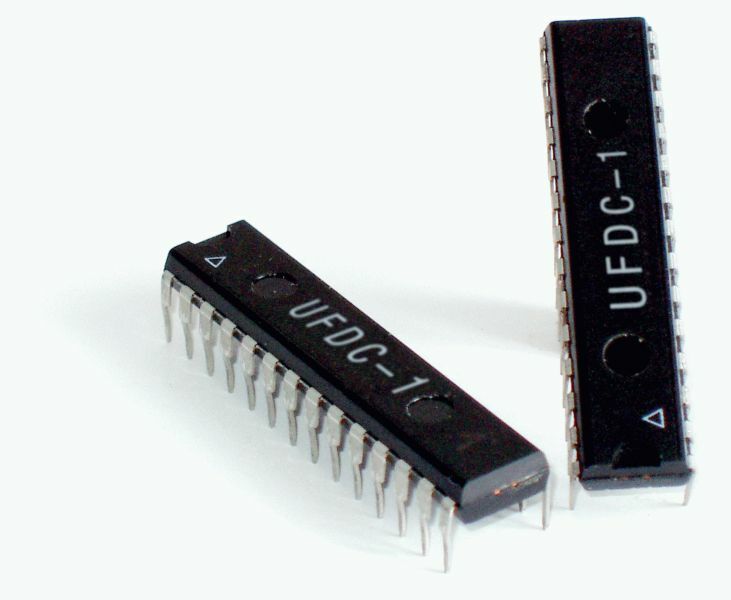 Full-Featured development kit for the Universal Frequency-to-Digital Converters UFDC-1 and UFDC-1M-16. 2 channel, 16 measuring modes, RS232/USB interface, master and slave communication modes. 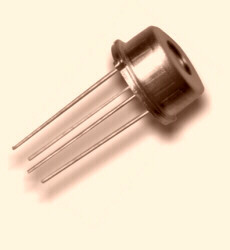 On-board rrequency reference (quartz crystal oscillator). Operation from 8 to 14 V AC/DC. 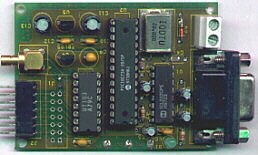 Evaluation board software on CD is included. Programmable, 2-channel IC for use with any frequency, period, duty-cycle, PWM, phase-shift and pulse number sensors outputs .There are 29 measuring modes, 1 generating and calibrating mode. Frequency range 0.05 Hz - 9 MHz (144 MHz with prescaling); programmable accuracy 1- 0.0005 %. Direct interfacing for capacitance, resistance and resistive bridges sensing elements. Programmable, 2-channel USTI IC with with extended temperature range (-55 0C to +150 0C), reduced conversion speed (from 6.25 ms to 12.5 ms for relative errors from 1 % to 0.0005 % respectively) and increased baud rate for the RS232 serial interface: up to 76 800. The rest metrological performances are the same as for the UFDC-1M-16. 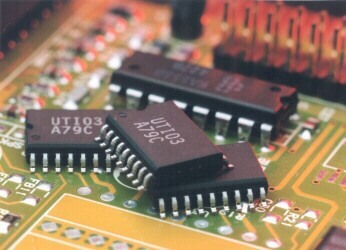 Low power, low voltage version of USTI IC. Active supply current < 0.85 mA, voltage supply 1.8 V. Frequency range 0.25 Hz - 1.95 MHz (30 MHz with prescaling); programmable accuracy 1- 0.0009 %. Direct interfacing for capacitance, resistance and resistive bridges sensing elements. The SMT172 is an integrated temperature sensor, with a duty-cycle output. Sensor has a wide temperature range: -45 °C to 130 °C and absolute error ±0.25°C (-10 °C to 100 °C). Sensor has ultra low active current 60 mA active and wide supply voltage range: 2.7 V to 5.5 V.
RH can be measured without the complicating factor of temperature and pressure. High performance, long term stability, close tolerances, reliable construction and low cost. Suitable for climate control, storage and warehouses, food processing, meteorology, etc. The UTI is a sensor - to - time signal converter. Sensing elements can be directly connected to the UTI without any extra electronics. 16 different modes. Provides interfacing for capacitive sensors, platinum resistors, thermistors, resistive bridges, potentiometers. The Smart Temperature Acquisition System(SMTAS08) is an 8 channel temperature measurement system. Designed to get the best possible measurement results with the SMT160 Smartec temperature sensors. The kit is especially designed for quick setup and easy design. Connected directly to a PC via a COM port. All 16 modes of the UTI can be chosen remotely. The UTI data can be read via a terminal or customer made software. Connected directly to a PC via a COM port. No power supply is needed. The temperature of 4 sensors can be measured simultaneously and read out via a terminal program (Windows 95/98/NT/2000), or customer made software. The SPD series pressure sensors are especially designed for, measurement of pressure in the range between 0 and 6 Bar (specific full scale ranges are available). 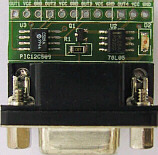 It is ideal for mounting on PC-Boards and for digitizing with the UTI03. Silicon infrared sensors and comprise of so called thermopiles. Can be used for radiation temperature measurement without any contact. 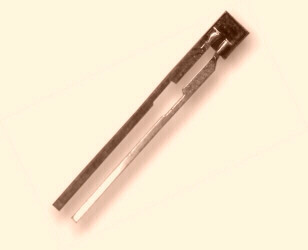 The temperature range of the sensor-element is between - 40 to 100 °C. High accuracy and sensitivity. 40 ms response time. Development kit for capacitance, inductance and frequency measurements. Features: two ranges for capacitance measurement: 0.1 pF -0.2 µF, 0.2 µF - 10000µF, 1 % accuracy; inductance: 0.01 µH - 2 H, 1 % accuracy; frequency: 1 Hz - 50 MHz; sencitivity - 100 mV. Current consumption 50 mA at 5 V.
Digital scale with 3 inputs and frequency counter. There is a frequency self-tuning mode. 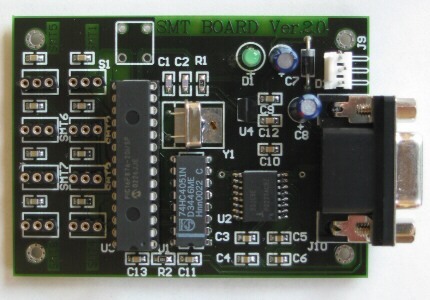 This development kit consist of two PCBs: measurement and indication. Maximal input frequency - 70 MHz; absolute error ± 100 Hz; number of frequency inputs 1 (3); minimal input voltage - 30 mV; maximal input voltage - 3 V; time of measurement - 0.1 s.